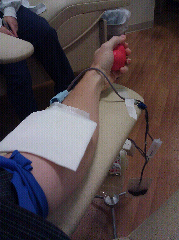 I'm trying to get back into the habit of donating blood - something I used to do on a somewhat regular basis years ago. Thing is, I'm still nervous around needles but I try not let that slow me down. This morning, as in the past, I used an Inova Blood Donation center to make my deposit. They'll gladly make an appointment for you to avoid waiting. Seriously, it's a good thing to do, so go make an appointment.